T-Bones win one for the Ehlerts – Welcome to Wyandotte Daily! If the Ehlert family indeed does sell the Kansas City T-Bones baseball team, they’ll go out at the top of the game. Riding the managerial genius of Joe Calfapietra, the biggest home run in club history and stingy relief pitching, the T-Bones won the 2018 American Association championship Saturday with a 5-3 win over the St. Paul Saints. It was the first AA championship for the T-Bones, who twice won Northern League championships, the last time in 2008. This one was extra special because of the adversity the club faced during the season. Major league franchises signed eight players off the T-Bones roster during the season; three others signed with the Mexican League. And yet Calfapietra and General Manager Chris Browne kept coming up with solid replacements. “We’ve been so resilient all year; there was no stopping us,” Calfapietra said. Voted the league’s Manager of the Year, the club finished the regular season with a 62-37 record, the most wins in franchise history. To win the title, the T-Bones also had to defeat the Sioux City Explorers, who won the Southern Division title by a whopping nine games. After splitting the first two playoff games at home, the T-Bones won two of the three at Sioux City, the clincher 4-2 behind the efforts of pitching ace Tommy Collier, the league’s biggest winner at 13-4. 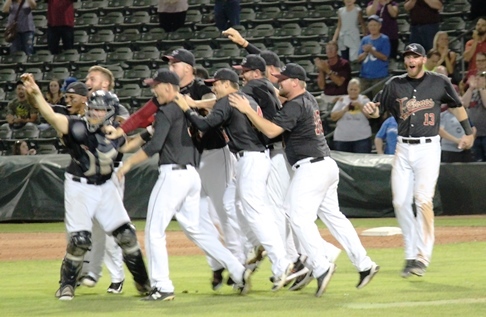 Splitting the first two games at Northern Division champion St. Paul (winning 11-4, losing 6-0), the T-Bones took the pivotal third game, rallying from a 3-0 deficit behind the pitching of Collier and two home runs by Todd Cunningham, one a game-winning grand slam. Cuban born second baseman Alay Lago, who was acquired July 24, provided the game’s biggest blow in the game-clinching 5-3 win Saturday. With the T-Bones trailing 3-2 in the sixth, Adrian Nieto singled and Lago followed with a two-run home run, a blast that soared far over the wall just inside the foul pole in left field. It was only the 13th home run of Lago’s career in nearly 400 games. The T-Bones tacked on another run on Noah Perio’s ground rule double in the seventh and Nick Lee and relief ace Cody Winiarski took it from there. Lee retired five in a row before giving up a two-out single before Winiarski retired the final four Saints. Kansas City was without a hit against southpaw Chris Nunn the first four innings but still mustered a 1-0 lead. Cunningham walked in the fourth and scored on a ground ball, wild pitch and Nieto’s sacrifice fly. St. Paul scored all of its runs in the fifth. After a walk and an RBI double by Joey Wong tied the game and kayoed starter Jared Mortensen, Kyle Barrett and Brady Shoemaker greeted reliever Marcus Crescentini with run-scoring singles and a 3-1 lead. Keith Curio finally broke up Nunn’s no-hitter with a ringing double to right with one out in the fifth and scored on Danny Hayes’s single and Lago and the relief corps took it from there. Crescentini, who retired the side in order in the sixth, got the win. The final out, a fly ball, touched off a wild on-field celebration by the T-Bones. “I want to thank the players, the coaches, everyone in our organization,” T-Bones owner John Ehlert said in accepting the championship trophy along with his son, team president Adam Ehlert. The Ehlerts have announced that because of age they are looking for new ownership for the club, preferably new local ownership. In 17 seasons, the T-Bones finished above .500 just three times but twice won Northern League titles with sub-.500 records. More than 2,200 turned out for the championship game including a big contingent from St. Paul, Minnesota. To see more photos from the game, visit http://wyandottedaily.com/t-bones-win-5-3-to-claim-american-association-championship/. The owners want to sell the T-Bones? Well, that answers a lot of questions. No Championship paraphernalia immediately following the game. No announcement from the mayor congratulating the team. Was the mayor even at the game? No plans for a parade? Don’t the players and coaches deserve better than this from KCK? When they won the championship in 2008, they had a celebration at Danny’s a few days later. At that time you could buy a championship T-shirt and get it autographed. The city did nothing for the T-Bones in ‘08 either. Championship T-shirts for this season can be ordered now, but you’ll have to wait until next season to get it signed; by then half the team will have been traded. The mayor, in my opinion, is not a T Bones fan. What a terrible shame if this community loses the team. I’d hate to see the ballpark torn down or sit empty.